To encourage cross-border transactions in the Single Market of the European Community, the Commission has proposed general framework legislation to set general standards that forbid unfair marketing practices towards consumers, thereby increasing consumer confidence when deciding whether or not to shop abroad in the Community, either in person or through modern methods of electronic purchasing through the Internet. 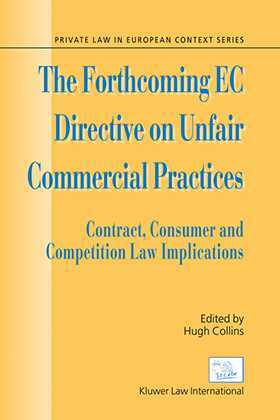 The essays in this volume critically examine the proposed Directive that prohibits unfair commercial practices, and in particular they consider the potential legal and economic implications of a legal duty to trade fairly in the context of general contract law, the protection of consumers, and the needs of competition policy. The distinguished authors of these essays, from Finland, Germany, Italy, The Netherlands, Spain, and the United Kingdom, explain the different approaches of national legal systems to the legal regulation of marketing practices, and assess the compatibility of the proposed Directive with national law and its likely success in achieving the promotion of trade in the Single Market. About the author Hugh Collins is Professor of English Law at the London School of Economics. He studied law at Oxford and Harvard. He has published extensively in the field of contract law including The Law of Contract 4th ed (London, Butterworths, 2003), and Regulating Contracts (Oxford, Oxford University Press, 1999).